Do you need more engaging social media content? Are you looking for ways to discover great content to share with your fans? What if there were great tools that surfaced popular content you could share? In this article I share five tools to help you discover great content and brainstorm new ideas. When you visit BuzzSumo for the first time, you’ll probably wonder why no one thought of this tool sooner. It is so helpful! 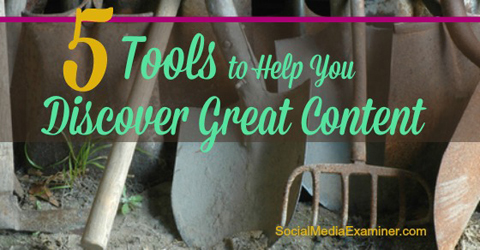 Discover great content with these 5 tools. BuzzSumo lets you research a keyword to find out what content people are sharing the most. You can take those ideas and build your own update or articlearound them. When you know what content is most popular, you have a much better chance of overall engagement. You can also use the search results to see who else is posting about that topic, view your competition and track how others use social media. If you want to streamline your search efforts, you can filter results by guest posts, infographics, articles, giveaways, interviews and videos. BuzzSumo’s keyword search feature helps you come up with new ideas. Looking for influencers? BuzzSumo helps you find the experts who post about the topics and keywords that matter most to you and your fans. Wherever the influencers are hanging out is where you want to be. Promote and share your content across the same social media channels. If you manage multiple social media accounts and audiences, you are well aware they expect a continuous stream of content. When you already know an idea or topic is popular, you can share it or write about it with confidence. If others enjoy it, odds are good that your readers will too. The social experience isn’t all about finding links to articles or blog posts from top-tier media, yet that’s what most of us are primarily publishing. Many of your fans would love to see more than text or basic images in your updates. It is no secret that visual content is hot right now and rich media (like presentation slides) are an important part of that trend. If you are ready to create and share slides, but need ideas to get you started, I encourage you to check out eMaze, a platform for creating slideshows and presentations. 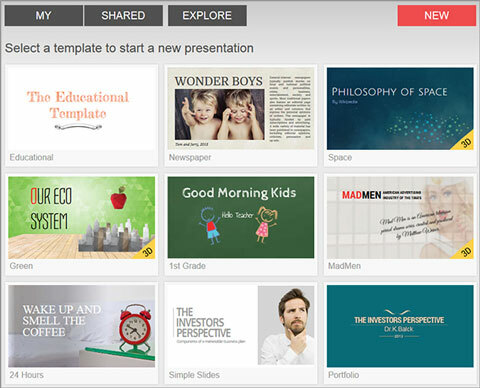 Take a look at popular presentations to find interesting topics. Use the eMaze Explore feature to search for popular presentations about the topic you’re interested in (you may even come across a topic you hadn’t considered). It is a great place to find inspiration and ideas—both for writing content and creating your own rich media. So many marketers use HootSuite—and why not? It’s the super-mega-awesome tool for managing multiple social media accounts and syncing all of them on the fly. It can even help you find new topics your audience will love. HootSuite’s new Suggested Content feature is designed to bring you the most relevant content from across the web and social media based on the topics you’ve interacted with in the past. For example, HootSuite analyzes your Twitter post history and recommends relevant articles based on what you, your friends and followers have liked. Find topic ideas based on what has appealed to you and your audience in the past. Based on how popular certain topics have been, you may want to find and repurpose existing content or build upon it. If you do not already have related content, now is your chance to fix that. If you’re already using HootSuite, you will find that the Suggested Content feature is an ingenious way to add even more value. 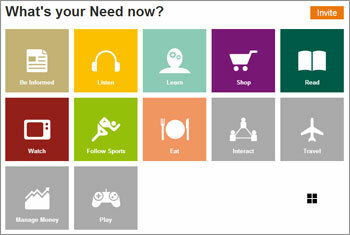 Theneeds provides new relevant content specific to your… well, needs. Both the personalized website and the iOS application show you articles, blog posts, social updates, videos and more according to the interests you specify. This tool’s results are based on what you have actually liked, read and engaged with over time. You will find expected and unexpected results—both are a good start for creating better content. Find trending topics related to what you and your audience have liked in the past. You can also just choose one of the general options to find out about what’s happening now. That is definitely helpful when you need to keep up with what’s going on in your niche—and what content manager doesn’t? You don’t always need to find existing content you can share. There are a lot of times you just need help getting started—whether it’s writing your own article or a social media update. That’s where Portent can really help you. Portent is different from the other tools in that it doesn’t find content for you. Instead, itgives a working title you can build content around. Depending on the keyword you type in, you can get some pretty crazy stuff—which isn’t always a bad thing. Why stick to the mundane? Find some off-the-map ideas to share with your audiences. I discovered Portent when I was focusing more on SEO and needed creative ideas for blog posts (ah, those were the days!). I’ve found this freebie tool to be just as awesome for finding social media article and update ideas. We all want our articles and updates to spread like wildfire—creativity and originality stoke that fire. Finding new ways to present fresh content makes you stand out in the news feed. Even if you are already active and successful on social media, there is always room for improvement—especially in a marketing space where change is the norm. I hope the five tools I’ve discussed here help you find fresh ideas and encourage you to experiment with new types of content.